Early pace-setters Eaton Bray and New Bradwell shared the spoils on Saturday when first met second at Bradwell Road in Four Counties Division 1. Kieran Lampard (79) and Allen Bridgeman (54) helped fire New Bradwell to 254, as Bray’s James Flecknell took 5-51. In reply, Paul Fox got the innings underway in quick fashion, taking two early wickets, but while the visitors were close to the run rate, wickets continued to tumble. But they managed to hold out for a draw, scoring 215-9. New City are level on points with New Bradwell after beating Milton Keynes by nine wickets. A sensational performance from Daniel Pieterse saw him take 6-16 as MK were skittled for 124. And Pieterse was the star with the bat too, hitting 50 alongside fellow opener Dharmesh Mistry who added an unbeaten 51 as New City (125-1) cruised to victory. Reigning champions North Crawley are struggling with their title defence after losing to Elstow. They thought they’d done enough with the ball in hand too, with Elstow unable to cope with Robin Platten, who took 4-24 as the visitors were bowled out for 138. But with just three batsmen in double figures, North Crawley were all out for 114, losing by 24 runs. Olney (177-9) were undone by Biddenham (181-6) and are seventh after three matches. A brilliant century from Vijay Baburaj helped Division 2 leaders Printers (235-8) to a two-wicket victory over Old Bradwell (149). Baburaj hit 103, and captain Razzan Mohamed added 63 as Printers set the pace. The skipper then took four wickets, as did Sanjeevan Sritharan to bowl Old Bradwell out for 149. Newport Pagnell rescued victory against Open University to go third in the table. After being bowled out for 148 (Lewis Hefferon 58), OU were bowled out for just 99. North Crawley 2nds (70) were thumped by Buckland & Aston Clinton (187), while an under-strength Cranfield University (95-9) lost to Bromham (256-7) . In Division 3, leaders Westcroft (116) stumbled against Stoke Hammond (117-8) to lose by two wickets. They remain on top though. Shenley Church End picked up maximum points when Studham conceded to move third. MK Warriors are top of Division 4 after crushing Milton Bryan. Setting 179 in their innings, Raja Rasool took 4-21 to clear Milton Bryan for 76. Asim Chishti made 60 not out took three superb catches and an athletic run out to lead Westcroft 2nds (198-6) to victory over New City 2nds (114). Olney 2nds (127-5) beat Wilden (87) by five wickets as Phil Bennett top scored with 60. 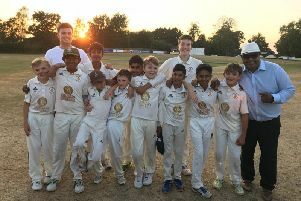 In Division 5, Great Brickhill 3rds ( 189-6) beat Eggington Foresters 2nds (76), North Crawley 3rds (56) lost to St Andrews (110-9), MK 2nds (131-9) lost to Soulbury Village (132-2), and New Bradwell 2nds (111) lost to Lidlington (112-6). In Division 6, Aspley Guise 2nds beat Old Bradwell 2nds, Spartans (106) made light work of Newport Pagnell 2nds (62) and MK City 2nds (239-7) crushed Leighton Buzzard 3rds (133). In Division 7, there were wins for New City 3rds, Westcroft 3rds and Great Brickhill 4ths.